You may know that the Flash Based 3D Sliders of SIMPLIFY, Premium and SPARK themes are very popular among the Web Developer and Designers. We introduced the 3D Slider in WordPress Themes for the First Time in 2012. 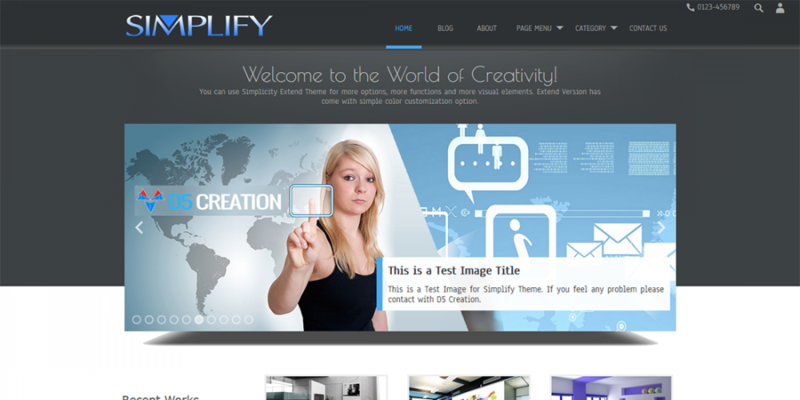 SIMPLIFY was among the top 5 most popular Themes at WordPress many times. It was also listed as a Featured Theme many times. But now a days the 3D Flash Slider Issue is well known for older version users. Don't Worry! There are new 3D Sliders for all of These Themes. There are thousand of websites developed using these 03 Themes. Recently some of you who are using the older versions are reporting that the Flash 3D Slider is not working. No More 3D Slide Issue ! If you still have the Membership Duration validity you can download the Latest Version. We are sorry for any inconvenience this may have caused to you. D5 Creation is always sincere for the users. You may know that WordPress releases 02 Major Versions every yeas including many Minor Updates. These updates include security, performance, technology, user experiments enhancement. We also update our Themes regularly introducing new technologies, features, security and performance. So, updating WordPress Core, Themes and Plugins are necessary for your Sites. You should not Skip those updates. You may loss valuable data, your site may becomes vulnerable for older scripts, your site may become slow, may become older in design if you don't update your site regularly. So, No more 3D Flash Slider Issue now!